If you are using Fancy Facebook Comments Pro plugin, follow the steps mentioned below to enable Facebook Comments in the content of individual page/post. You can use [Fancy_Facebook_Comments_Pro] Shortcode in the content of required page/post where you want to display Facebook Comments interface. If you have already installed the Fancy Facebook Comments Pro plugin, following are the steps to configure it. Here you can configure the basic things, like font-size, font-family, background color of the Facebook comments box, placement of Facebook Comments box etc. The options are self-explanatory and if you want more details about any particular option, you can click the (?) icon before that option. Generate a Facebook App ID as described at the link http://support.heateor.com/how-to-get-facebook-app-id and save it in the Facebook App ID option OR if you already have one, save that in this option. After saving the Facebook App ID, you will see a link right below Facebook App ID option – “Go to moderation dashboard“. This link will redirect you to moderation dashboard where you will see the Facebook Comments made all over your website. If you are not able to see comments there, navigate to Facebook debugger tool and fetch new scrape information for the webpage for which you are having issues to see comments. After fetching new scrape information, refresh the moderation dashboard. Facebook App Secret is required only if you want to show recent Facebook Comments in a widget (Recent Facebook Comments) that you can enable from the Appearance > Widgets page in admin. If you want to moderate the comments right from the webpage where comments are made, you can save your Facebook account numeric ID in the Moderator FB ID(s) option. Click the (?) icon before this option to get an idea about where to get the numeric ID associated to your Facebook account. After saving it and refreshing any webpage, you will see Moderation Tool option in the Facebook Comments interface at your webpage. If you don’t see it, you need to fetch new scrape information as mentioned in the step 3. Other options are self-explanatory. You can click the (?) icon before the individual option to get an idea about that particular option. All the options are self-explanatory. If you need more details about any option, you can click the (?) icon before that option. In this section, you can configure the opt-in for the Facebook Comments to make it compatible to the EU-GDPR law. 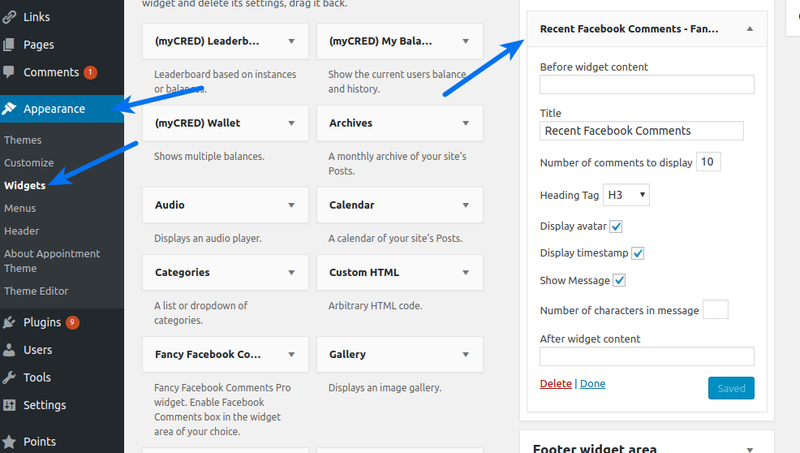 Here you can enable integration with myCRED plugin to reward website visitors for posting Facebook Comment. Recent Facebook Comments section shows the Facebook comments made at your website after installing the Fancy Facebook Comments Pro plugin. Comments posted at your webpages might or might not get saved here depending upon the privacy settings of the Facebook account of comment-poster.